THIS IS A NEW OLD STOCK MODEL 60 AND 70(GAS) THERMOSTAT. 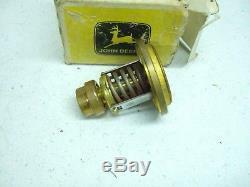 The item "NOS John Deere Thermostat AF1522R 60 70 Gas AF1710R 173-186 DEG" is in sale since Tuesday, November 6, 2018. This item is in the category "Business & Industrial\Heavy Equipment, Parts & Attachments\Heavy Equipment Parts & Accessories\Antique & Vintage Equipment Parts". The seller is "cedar-farm" and is located in Alvord, Iowa. This item can be shipped worldwide.